I swear to God, there is no glitch on my record (exactly this edition, bought in 2017). Give it try if you see it in a shop, maybe you're as lucky as me! This press has the original version (not the rework) of "Work That Mutha ......" on it. Also, the track does NOT have the glitch at 3:25 on it (which the Dance Mania presses do). However, the sound is not as crisp as on the DM presses, it sounds a little like a bootleg. I am sorry to say but this 12" can be filed under: HOW TO NOT DO A REISSUE! The master is obviously taken from a vinyl and unfortunately there was no effort made in any kinda of audio restoration, click and pops of the recorded vinyl are still present, it's even worse on the 3:25 min mark on Work That Mother….. there's a terrible glitch from transferring the digital recording, for me personal it leaves this release with a very shallow taste! Did they even listened to the test pressing before they started the presses :( … it could have been so good and turned out so bad. I think you can do this better in 2016 Dance Mania. Some more copies showed up at Juno recently. Unfortunately still have the glitch in A1. I'd say it's towards the final third of the record on my copy. Very disappointing. Most no doubt know 'Work That MF' & 'Computer Madness', being total classics. On the flip, 'Chillin' With The "P"' sets a real off-world techno vibe from the start, about as vintage sounding as it gets, hugely refreshing, and on this white & red label copy at least, pressed clean & loud (as with all tracks). 'Born To Freak' has to be my pick, partly due to being the underdog, and partly due to having a sharp sneaky acid line, staggered spitting snares & deep thumping toms- impossible to ignore. This track is for techno connoisseurs & will pound the floor to bits. If you want a decent press, this ones a safe bet. 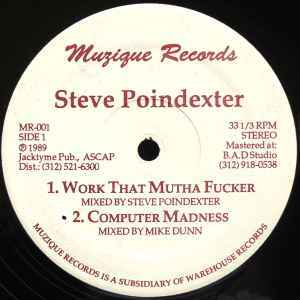 "Work That Mutha Fucker" was actually recorded (and played out by the likes of Armando & Frankie Knuckles) in 1987, but was only released in 1989. Which releases have got this glitch in,the later represses?